For many years they kept their longing close to hope, but when their hope ran out the longing grew until it became pain. When the pain grew too great to bear, the farmer took his wife down to the coast in the quiet days after the harvest, and told her it was time to put the longing away. He was a kind man; a crop farmer who regretted the harvest, cutting his crops with whispered promises that he would save the seeds and next year they would grow taller and prouder than ever. When he told his wife that they must forget about the baby they would never have, he tried to do it with the kindness he showed his crops, with stories of foreign travel and an unencumbered life, but the tears in her eyes washed away his kindness and in the end he simply blurted out the truth: I don’t want to try any more. That night while he was sleeping, his wife left his side and went down to the beach where she sat on the shore and gazed at the sea as it whispered its endless story. The stars hung low in a velvet sky like pearls and the air smelt of salt. She trailed the fingers of one hand across the sand, cool and gritty under her fingertips. When she looked down she discovered she had drawn an oval in the sand, an oval about the size of a Moses basket. She couldn’t bear to see the basket empty, so she knelt beside it and pushed and shaped the sand into a hummock, like a sleeping baby under a blanket. Then she shaped its head, and the sand, obedient to her command, formed eyes, nose, mouth and ears. She skimmed her hand over the surface of the blanket and it fell in folds about the infant. She stroked its head, round and smooth, and caressed its cheek, plump as an apple in the sun. When she had finished, she leaned back and saw the most perfect baby she could have imagined, but utterly without life. She bent forward over the baby and cried, her tears falling on its still, sandy face. When she had no more tears left, she kissed the baby on its forehead then walked away, brushing grains of sand from her lips and listening to the sea breathing in and out on the shore. She slipped into bed beside her husband. In the morning, when they got up and walked on the beach, the sand stretched out before them, a flawless sheet of gold, and she didn’t tell him about the sand baby she had made. Nine months later, in the small town up in the hills, their daughter was born. They called her Kaia, meaning ‘of the sea’, and for the first year or so all was well. Kaia grew plump and joyful, with wide blue eyes and pale golden hair and when she slept in her Moses basket her mother often thought she had the look of the sand baby with her smooth, round head and plump apple cheeks. She would bend and kiss Kaia’s forehead and be amazed not to feel grains of sand on her lips afterwards, then she would laugh at herself and go about her household business until Kaia woke up and needed her. Just after she turned one, Kaia stood up on her chubby little legs, and took her first steps. Her parents, filled with pride, invited their friends and family to come and witness their daughter’s achievement, and it was only when they were all gone and Kaia was asleep, that they noticed the sand strewn across the floor. It must be from the guests, they thought, although they couldn’t think how anyone had come by sand so high up here in the hills, and they swept it up and tossed it into the garden. Every day Kaia walked further and further, and every day more and more sand had to be swept up and tossed into the garden, until they realised that with every step Kaia took she left a tiny footprint of sand behind. As she criss-crossed their house the tiny footprints joined one another and the piles grew and grew until they were sweeping panfuls out into the garden. For a time all was well, but the more Kaia walked, the more sand puffed up from her feet and the fuller her shoes got until sand spilled over the top. Every night, and then twice and three times a day, her mother tipped the sand out into a corner of the garden and the pile grew and grew until her father took some planks and fenced it in to make a sandpit. Kaia played there for hours, at first making piles and tunnels, then as she grew older creating caves and castles, guarded by long scaly animals the likes of which nobody had ever seen. Still the sand kept appearing in her footprints and gradually the mound in the sandpit rose up until the wind blew sand over the edge to lie in great swathes over the garden where the grass turned brown and died under its smothering load. “What kind of a farmer is it that can’t keep his own grass alive?” the neighbours would joke, and although Kaia’s father always laughed, a great shame ate at his heart every time he looked out of his window and saw his dead garden. When Kaia got to school age and the sand began to creep out of the garden, forming banks and hummocks that threatened their fields, there was no more fencing or joking to be done. The family left their home to go and live on the coast where Kaia’s sandy footprints might be swept straight on to the beach and absorbed, with none of their neighbours any the wiser. They took a little seaside cottage by an isolated bay unpopular with both locals and visitors, bought Kaia a pair of shoes two sizes too big and sent her to school with instructions to empty them out into the garbage bins at recess. Her father took on yard work, a poor apology for crop farming, but with the money he made and the proceeds of the sale of their farm, they did well enough for a while. The first time she saw the beach, in all its great yellow vastness, Kaia’s heart fluttered inside her in a way she couldn’t understand. She played there for hours, rolling and wallowing in a great sandy bath, so that when she came home, sand poured not only from her shoes, but also from every piece of clothing. At night she slept with the window open, listening to the wind and the sea, wishing she were out on the sand. Her mother would smile from the kitchen window as Kaia scampered on the beach after school, building palaces and kingdoms from sand, decorated with seaweed, and protected by great dragons with spade-shaped tails and fins for wings. The farmer, however, hated to see Kaia on the beach, which to him was nothing more than a giant version of his lost garden. Here on the coast, nothing grew but spiky brownish grass and spindly bushes with salt-encrusted leaves, so his yard work meant mowing and trimming, not helping anything to grow. Once he dug a vegetable bed in the brown grass and planted a few of the seeds he had brought from his farm in the sullen, sandy earth. Not a single one sprouted and soon the garden beds were swarmed over by the spiky grass. He locked the last few wrinkled seeds from his farm in an old leather case and put it high in a dark wardrobe. Just after Kaia turned seven, in her second year of school, her teacher called her mother aside and asked her not to allow Kaia to go to the beach before school, because the other pupils were complaining about the sand under the table. Her mother did not mention that Kaia had not been to the beach in the morning and took Kaia to the shoe shop to buy a pair of long leather boots. Kaia complained that her feet were too hot, but her mother said: How else can we hide this? And Kaia bowed her head for she was learning that to have sand in her footsteps was something shameful, something to be hidden from the world. The long boots worked for a year or so and then the teacher called her mother in again and laughed that Kaia must be crazy about the beach, because now there was sand not just under the tables, but all along the corridors, as if Kaia were filling her long boots with sand in the morning and tipping it out all through the school. Her mother laughed with the teacher, but the next day she bought textbooks and pens and took Kaia out of school to teach her at home where they were accustomed to floors covered in sand. Kaia was happier at home than at school, with no children to tease her about the sand that gathered around her and the way she always smelt salty and seaweedy, like the sea on a hot day. Sometimes they would go down to the beach and sketch pictures and stories in the sand or use pebbles and shells to work out math problems. On the beach Kaia learned fast and easily. When he came home, drained from the endless mowing, her father relished the smooth, clean floors, but when Kaia returned from the beach sand rapidly covered the ground again and he would stamp on the floors in disgust. Sometimes he took down his case of seeds and ran his hands through them, breathing in the smell of the earth, then closed the case before the light could taint them. Every time he closed the case he felt like he was closing his heart. In the morning, floods of sand spilled from the end of Kaia’s bed where her feet had moved restlessly through the night. One night her father tied her feet together to keep them still, although his wife pleaded with him not to. Kaia cried so much that by midnight he relented, only to find her sound asleep with salt tears streaming down her cheeks. He untied her feet anyway and saw how they unthinkingly stirred into rhythmic motion, following the pattern of the sound of the waves through her open window, the grains of sand grating against her sheets. In time, Kaia’s mother taught her less and less, because she could not see any need for reading, writing and arithmetic when all they wanted was to be on the beach. The two of them whiled away the hours building fantastical buildings and beasts to Kaia’s design and it made Kaia happy to see her mother’s slim, pale hands patting the sand into shape next to her own, drawing pieces of dried seaweed down it to make delicate scales and patterns, topping battlements and terraces with shells and seaglass like jewels. Every day they devised extraordinary constructions, sometimes towering high above them, sometimes burrowed down beneath the surface of the sand in dark subterranean worlds that smelt of seaweed and decay, but with damp, undulating walls that it gave them pleasure to run their hands along. At night, sand surged from under Kaia’s sheets into huge drifts that pressed against the walls and poured through her window on to the dunes below. Her mother pleaded with her father to shovel it down to the beach, but he said he was too tired. The truth was the sand disgusted him. He was tired of the way his feet were always gritty, the way it gathered in the folds of his clothes and the way that when he chewed his food he felt as though he were cracking thousands of grains between his teeth. More and more often he would pull down the case of seeds to run his hands through his past, until the night he opened the case and found it full of sand; the night he knew the sand had worn him to the bone. “How many sacrifices must we make for this child?” he cried as he showed his wife the case. The farmer closed the case. He took his case of seeds and carried it back to the small hill town they had come from, where he took a small house by an empty field. There, he opened the case, picked out every grain of sand and planted the seeds in the earth. When friends and family asked what had become of his wife and daughter he would shake his head in sorrow and they didn’t like to ask any more. By now Kaia was not walking through sand, but wading through it, and her mother could no longer keep up with the sweeping. The furniture stood at a slant on an uneven layer of sand, and it filled their wardrobes, beds and pots and pans. “It would be simpler if we lived on the beach”, said Kaia. They made a bed for her mother above the waterline under a roof of sheets and canvas and at night Kaia simply lay beside her on the sand and was never cold or damp, and every morning they would awaken and start building their castles and palaces, creating and shaping the sand until nightfall. At first they visited the house to eat, but in time the sand swamped the building entirely until only its rooftop showed over the dunes. Kaia discovered the wonder of eating sand, sweet and salty, sucking water from between the grains to satisfy her thirst. The sand satisfied her as no food had ever done and, her mother watched with pride, despite the hunger that raked her own belly, as Kaia grew stronger. In time people grew to hear of the extraordinary creations on the lonely beach and came to watch Kaia and her mother working on their zoos and cities and countries, all peopled by fascinating creatures and plants and all washed away overnight and built again differently the next morning. Kaia and her mother barely noticed the people, standing on the headland above them, so absorbed were they in their own sandy world. Then came the morning that they decided to build one of their subterranean cities and the people who by now had come from far and wide, were dissatisfied not to see the beauty of their work. They invaded the beach and pushed their way into the fragile tunnels, which collapsed around them, sending them out, spitting grit and rage at the crazy sand women. The people kicked and stamped the tunnels they had not already destroyed and didn’t leave until there was nothing left on the beach but the scars of their feet. “I don’t think I can”, said her mother and Kaia noticed then how pale she was, how translucent and the way her bones poked at her skin. “What can I do for you?” she asked, but her mother just smiled up at her with colourless lips and that night they slept together in the sand and in the morning her mother was dead. As the sun tinted the sea with early-morning orange, Kaia dug her mother’s grave, a perfect rectangle just below the waterline. She laid her mother in it and stroked her dry, grey hair, then laid a blanket of sand over her, skimming her hand over the surface so it fell in folds about her mother’s body. She kissed her mother’s hollow cheek, then filled the grave with sand mixed with tears. When the grave was full, Kaia lay next to it, burying her hand in the sand she had heaped over her mother. As the waves flowed up the beach, they spilled over her, washing her feet with water that felt neither cold nor hot. Kaia lay still, accepting the kiss of the sea. Her feet softened in the water, the edges of her nails blending into the skin of her toes, toes blending into her feet, feet into ankles, until her legs became formless, rounded ridges that became less and less every time the water passed over them, until they dissolved into it and were gone. She turned her head and gazed across the infinite sand with a deep sigh of contentment. A soft wind blew, catching up some loose sand above the waterline, lifting it, then twisting it into whirlwind that hissed as it span towards her. 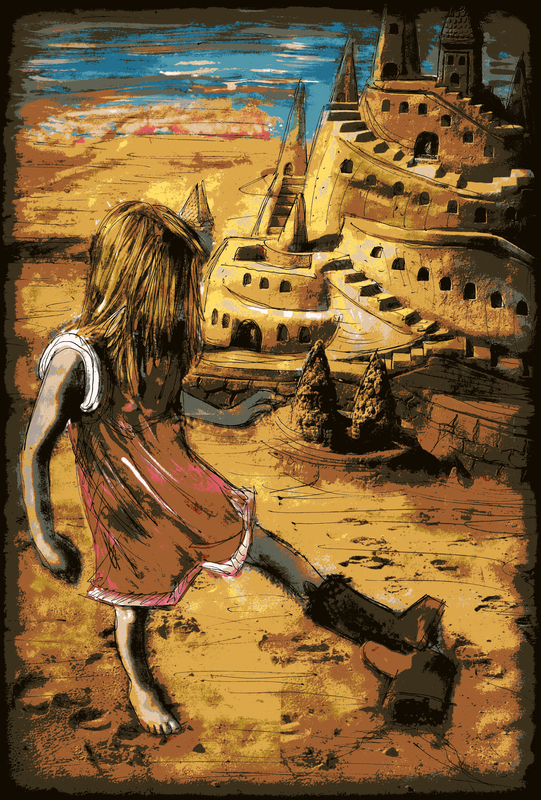 When it reached Kaia, the sand twirled over her body, and then the little whirlwind collapsed in on itself to cover her. The sand filled her mouth, nose, eyes and ears, creeping into every crevice of her skin. Kaia breathed deeply, filling her lungs and body with her precious grains, giving herself up to it. As the water crawled over her, she melted and dissolved, and every trace of her mother’s grave disappeared, so when morning came the beach stretched out, a flawless sheet of gold. That spring when the farmer’s seeds sprouted, green and fresh, his heart filled with joy. For weeks he tended the shoots, waiting for the buds to open into fruit and flowers. The buds bloomed in the middle of a hot day, when he happened to be in the middle of the field, but it wasn’t fruit or flowers that emerged, but sand. First a grain or two dropped from the nearest bud to land on his bare arm. He brushed them away, his skin recoiling from the familiar grittiness. Then another bud opened, and another, and another, each spouting mouthfuls of sand, and then more and more, until his crop withered and died under a mantle of sand. Year after year he tilled and sowed, but every crop was the same; no plant grew to adulthood and no field, however full of promise, ever gave him a harvest. The wind rose and whipped up the sand around him and in it he saw the shapes of two people, one tall and one smaller. He reached out his arms and as they bent down over him, embracing him in a cloud of soft, fine sand, he smiled. In the morning he was nowhere to be found and his sand-covered field stretched out, a flawless sheet of gold. Despite her benign appearance, Shona Snowden’s imagination tends to run to the fantastic and the horrific, as stories published in ‘Silverthought’, ‘Midnight Echo’ and ‘Stupefying Stories’ attest. Her work has also appeared in anthologies. Originally from Scotland, Shona now lives in Denver.